Total Mean Gas in Place set at 13.76 TCF, up 141% from pre-drilled estimates of 5.7TCF. An Independently Estimated Total Mean Prospective (Recoverable) Gas Resource of 5.48 TCF. A Maiden Independently Certified 3C Contingent Gas Resource of 672 BCF. A 2C Contingent Gas Resource of 276BCF. Put it all together, and you have an independent assessment of Real Energy Corporation Ltd’s (ASX:RLE) Cooper Basin gas play far higher than anything the company ever dared to put down on paper. Armed with this significantly upgraded set of numbers, RLE can now push to the commercialisation of its assets by selling to customers on Australia’s gas hungry east coast and look further afield to Asian markets. RLE has already struck a 10 year gas deal with Incitec Pivot for approximately 110 PJ of gas worth approximately $800M. Add that to the company’s cash position at the end of the June quarter of $3.7M, throw in a pending R&D grant of $6.4m, and the balance sheet appears strong. RLE is one of the few independent companies with significant exposure in the Cooper Basin – trading at discount levels when considering the size of 2C contingent gas resources against its peers. 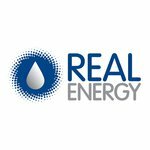 Real Energy Corporation (ASX:RLE) is currently valued at just $20M – vastly undervalued in our opinion – at The Next Oil Rush we’ve following this story since the May 2014 article: International Feeding Frenzy in Australia’s Hottest Shale Gas Region Puts Undervalued Junior on M&A Radar . 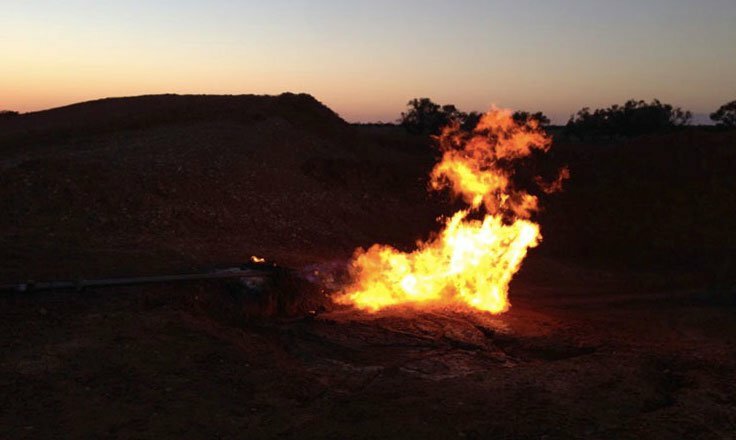 Maiden Well Spudding Imminent for RLE’s Red Hot Cooper Basin Gas Play. Success for RLE on First Exploration Well – Follow up Drilling Coming Soon . Takeover Trigger? RLE Hits Gas in its 2nd Cooper Basin Well. RLE Discover Cooper Basin Gas: Primed to Address East Coast Shortfall. Within the ATP927P and ATP917P, RLE is targeting big resources in the short term, proving up 3P (proven, probable and possible) reserves in two main gas formations – the Toolachee and the Patchawarra, big geological layers that dominate the Cooper. The prize here is two fold – if RLE can work up major gas resources in the Cooper Basin, it can supply gas to Australia’s growing eastern states domestic market. It can also export to Asia through the huge LNG export facilities being constructed, which will allow Australia to boost its gas trade and its own domestic consumption of LNG. The Cooper Basin is in the midst of a gas frenzy – if viable gas projects can be brought online there, it can pump gas through pipelines to the coast and find ready and willing customers, both in Australia and overseas. Will RLE be the next to receive an attractive takeover offer? Whilst there are no guarantees here, and RLE is a speculative investment, this is what management are ultimately aiming for. 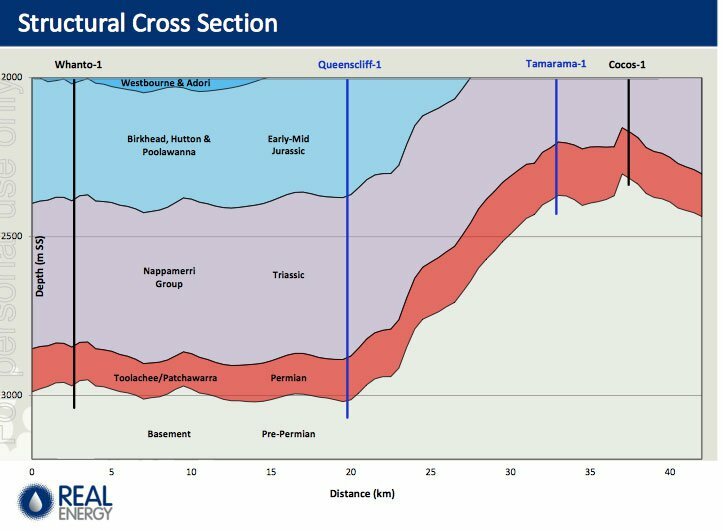 RLE’s neighbours in the Cooper Beach Energy seem to be spudding wells left, right and centre, while Santos recently made its seventh discovery in the Cooper. 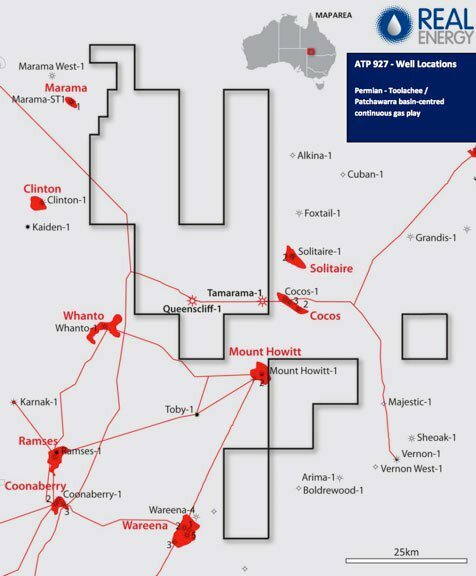 So far, RLE has drilled two wells within the ATP927P tenement called Queenscliff-1 and Tamarama-1. Both hit significant gas pays within the Toolachee and Patchawarra formations. This was an excellent result for RLE, which reckons its tenements hold a huge Basin Centered Gas Play (BGC) – a geologist’s report reckoned on 10.2Tcf of gas! 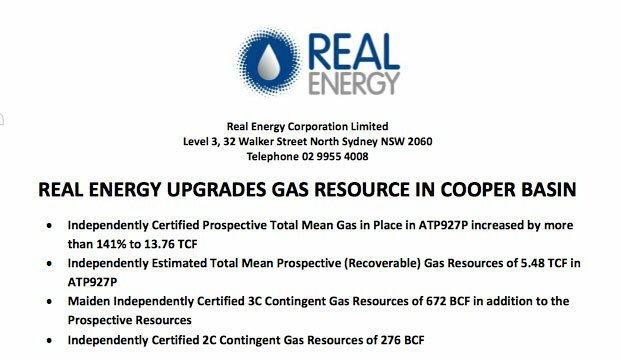 Far exceeding its original expectations, RLE has just been handed independent estimates showing a 141% boost to its Total Mean Gas In Place resources in the Cooper Basin for 13.76TCF. 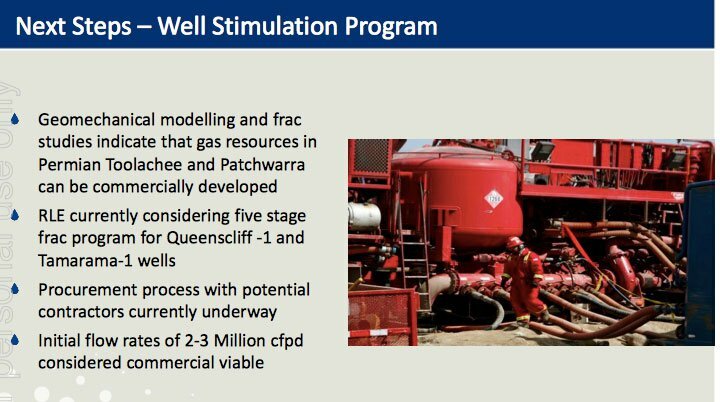 This significant upgrade to its gas play came on the back of the successful drilling and flow testing of the Queenscliff-1 and Tamarama-1 wells on the ATP927P tenement which struck the Toolachee and Patchawarra formations. 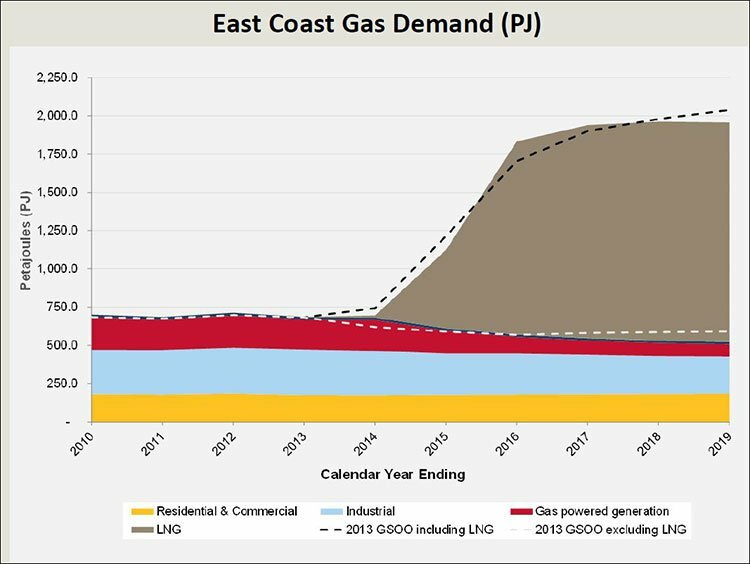 Those gas pays prompted RLE to make an internal estimate in late 2014 of a Contingent Resource in excess of 1Tcf of recoverable gas within its play – but RLE wanted firmer numbers to take to the market as it accelerates the play. The results show the Independent Certified Prospective Total Mean Gas In Place at ATP9279P increased by more than 141% to 13.76TCF from pre-drilled estimates of 5.7TCF – a significant upgrade. The Independently Estimated Total Mean Prospective (Recoverable) Gas Resource within ATP927P is set at 5.48TCF. These figures are based on prospective resources in the vicinity of the two drilled wells. In addition to these prospective resources, a Maiden Independently Certified 3C Contingent Gas Resource of 672 BCF is also listed along with a 2C Contingent Gas Resource of 276BCF. These are vastly encouraging results for RLE and reward its efforts to push the drilling of Queenscliff-1 and Tamarama-1 through so effectively. For RLE, the independent figures boosting is gas resource are the catalyst it’s been waiting for to push into development of its projects. It’s drilled the wells, worked up a big resource and has buyers lining up – the negotiations with Incitec Pivot are ongoing and the company has advised there are a few others jostling for position. RLE is now getting set to frac the Queenscliff-1 and Tamarama-1 wells to prove that the resources now independently assessed there can be delivered as viable and reliable gas supplies. RLE is set to achieve commercial development of its Cooper Basin acreage – a strong position that is the culmination of a lot of hard work. This next phase should see RLE work up both wells through fracking, proving they can be put into production, and then both could be flowing at regular rates with offtake customers paying to get their hands on the gas. Incitec Pivot, an Australian multinational manufacturing company, has already signed a non-binding LOI with RLE to bag up to 110PJ of gas over a 10-year period for its operations. A procurement process for contractors and equipment for a five-stage frac programme is now underway, with RLE targeting a commercially viable flow rate of between 2 and 3 million cfpd from the wells. In the coming weeks and months we’ll be looking out for contract announcements on the five-stage fracking programme RLE is pursuing, as well as timetables for the work. We expect well operations will begin sometime in the second half of 2015 and anticipate quick results – the independent assessment of large resources within ATP927P should give RLE a lot of confidence. We’ll also be looking for any news on the progress of that potential Gas Sales Agreement with Incitec Pivot and details on the other companies circling. RLE is still a relatively small company, and is a speculative investment. However, step by step, RLE is moving ever closer to becoming the next gas producer in Australia’s prolific Cooper Basin, meeting the ever growing demand for energy on the nation’s east coast and in the Asian region.